Invigorating the idea of computers based on fluids instead of silicon, researchers at the National Institute of Standards and Technology (NIST) have shown how computational logic operations could be performed in a liquid medium by simulating the trapping of ions (charged atoms) in graphene (a sheet of carbon atoms) floating in saline solution. The scheme might also be used in applications such as water filtration, energy storage or sensor technology. The idea of using a liquid medium for computing has been around for decades, and various approaches have been proposed. Among its potential advantages, this approach would require very little material and its soft components could conform to custom shapes in, for example, the human body. The NIST molecular dynamics simulations focused on a graphene sheet 5.5 by 6.4 nanometers (nm) in size and with one or more small holes lined with oxygen atoms. These pores resemble crown ethers—electrically neutral circular molecules known to trap metal ions. Graphene is a sheet of carbon atoms arranged in hexagons, similar in shape to chicken wire, that conducts electricity and might be used to build circuits. This hexagonal design would seem to lend itself to pores, and in fact, other researchers have recently created crown-like holes in graphene in the laboratory. 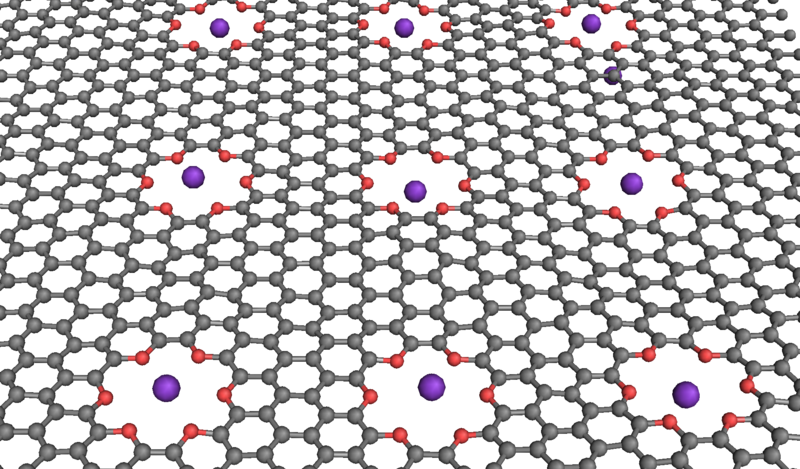 NIST researchers simulated computer logic operations in a saline solution with a graphene membrane (grey) containing oxygen-lined pores (red) that can trap potassium ions (purple) under certain electrical conditions. In the NIST simulations, the graphene was suspended in water containing potassium chloride, a salt that splits into potassium and sodium ions. The crown ether pores were designed to trap potassium ions, which have a positive charge. Simulations show that trapping a single potassium ion in each pore prevents any penetration of additional loose ions through the graphene, and that trapping and penetration activity can be tuned by applying different voltage levels across the membrane, creating logic operations with 0s and 1s (see text box below). Applying voltages of less than 150 mV across the membrane turns “off” any penetration. Essentially, at low voltages, the membrane is blocked by the trapped ions, while the process of loose ions knocking out the trapped ions is likely suppressed by the electrical barrier. Membrane penetration is switched on at voltages of 300 mV or more. As the voltage increases, the probability of losing trapped ions grows and knockout events become more common, encouraged by the weakening electrical barrier. In this way, the membrane acts like a semiconductor in transporting potassium ions. The research is funded by the Materials Genome Initiative. NIST simulations showed that ion trapping depends on the voltage across the porous graphene membrane, suggesting the possibility of performing simple ion-based logic operations. At sufficiently low salt concentration, the membrane’s highly conductive (on) regime coincides with low trapped ion occupancy, and vice versa. Direct electrical measurement of the membrane’s voltage, which might be used in an electrical circuit, is what’s known as a “read” operation.